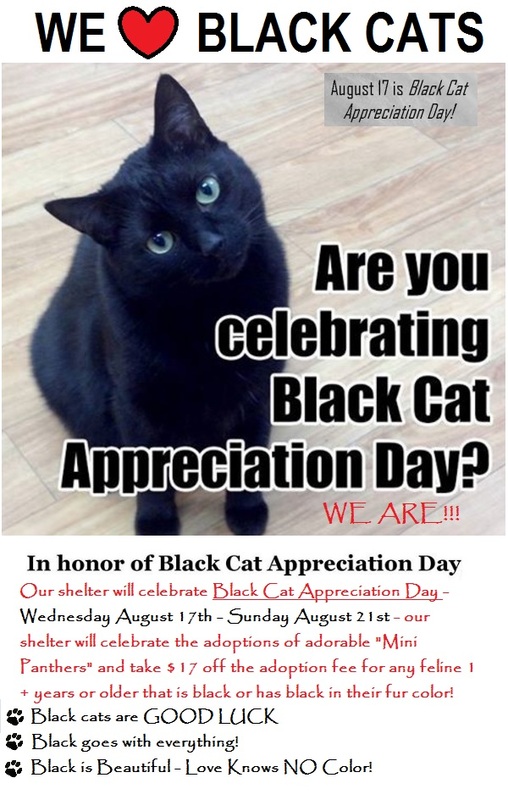 Hundreds of shelters nationally will be celebrating Black Cat Appreciation Day on August 17th. Our shelter will be celebrating the beauty of adopting these ebony beauties as well! $17 off any adoption fee for cats 1+ years or older for any black cats – or cats with BLACK in them. Because we think this is such an amazing way to celebrate the most common colored feline we are NOT ONLY CELEBRATING for 1 day – but will be offering this discount from Wednesday August 17th – Sunday August 23rd!